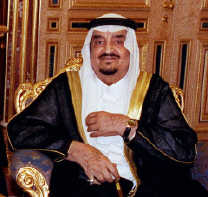 Fahd, already the major spokesman for the Saudi regime, became even more active as Khalid's health steadily deteriorated. This visibility and experience stood him in good stead when Khalid died after a short illness on June 14, 1982; Fahd immediately assumed power and Abd Allah, head of the national guard, became crown prince. One of the first problems that the new king faced was a 20 percent drop in oil revenues, as a result of a world oil surplus that developed by 1982. Despite the fall in revenues, until the oil price crash of 1986 Saudi Arabia did not make significant changes in the oil policies it followed beginning in the oil boom years from 1974 onward. Saudi Arabia also reduced the number of foreign workers employed in the country during the 1980s. Whereas a reduction in the number of foreigners had long been an objective, the drop in oil revenues facilitated its achievement. The reduction in Saudi Arabia's wealth has not decreased its influence in the Arab world. The kingdom, and Fahd in particular, have come to play a mediating role in inter-Arab conflicts. They continued, for instance, their efforts to stop the fighting in Lebanon. In 1989 King Fahd brought the entire Lebanese National Assembly, both Christian and Muslim deputies, to the Saudi resort city of At Taif. At the time, the assembly had been unable to meet in Lebanon because of military clashes and political violence. Once in At Taif, however, the Lebanese deputies voted on a plan for reform and were eventually able to elect a new president. Fahd's actions did not solve the problems in Lebanon, but they helped to end a particular stage of the conflict. Saudi Arabia has not been so fortunate in its relations with Iran since Iran's Islamic Revolution in 1979. In November 1987, Saudi Arabia reestablished diplomatic relations with Egypt. King Fahd visited Egypt in March 1989 and received an enthusiastic welcome on the streets of Cairo. His visit signified the end of Egypt's temporary isolation within the Arab world, but it demonstrated at the same time the important position that Saudi Arabia had achieved. Although Egypt was the country of Nasser, one of the most charismatic figures of the modern Arab world, it was the visit of a Saudi king that provided the ritual event to symbolize Egypt's return to the Arab family.